Description : Here we have a super rare limited edition SANDS Hotel & Casino, Atlantic City VIP/High Roller invitee closed circuit poster created for the Sands by the renowned artist Randy Hamblin for the mega fight showdown at Caesars Palace, Las Vegas, 10th November 1983. 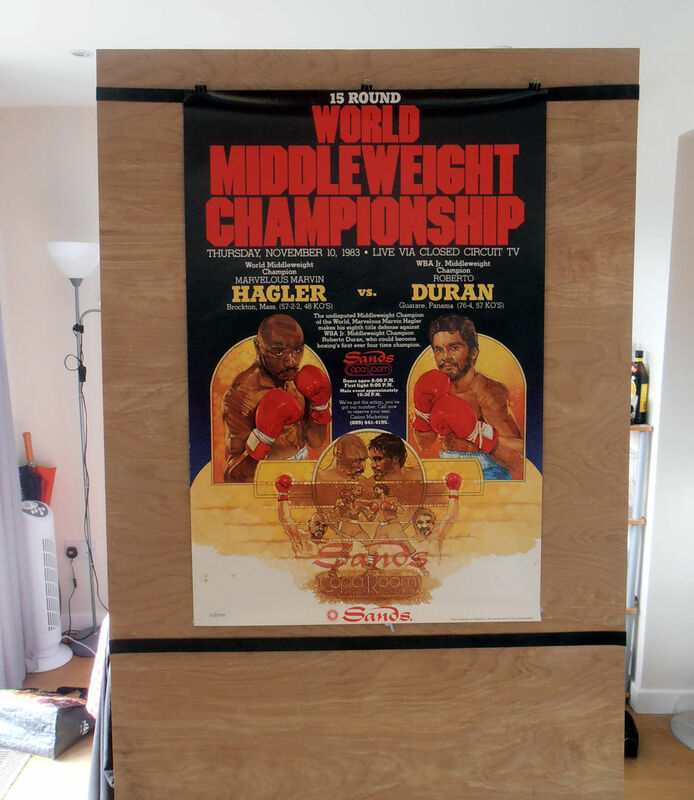 No one seriously gave Duran a chance, too small, too old & up against a fearsome beast in Hagler. Toward the close of the 12th round on that Thursday night, the crowd of 14,600 in the stadium at Caesars Palace in Las Vegas was on its feet roaring long after the bell had sounded. But the 12th, which Duran won with such a flourish, was mere prelude to what would happen in the next round. Duran brought the multitude up again, and again, and then it was chanting, "Dooooran! Dooooran! Dooooran!" Spurred on by the crowd and driven by the force of his own furious will and considerable talent, Duran, the WBA junior middleweight champion, appeared to seize control of the fight. Suddenly & quite miraculously there was a sense in the stadium that Duran, a 4-to-1 underdog, the former lightweight and welterweight champion of the world was about to make history by becoming the first man ever to win four world titles; and that Hagler's middleweight crown, which he'd won three years before and had successfully defended seven times, all by knockout, was in grave danger of being taken. Hagler was no longer marvelous now. It was Duran who had been marvelous. At that point judge Guy Jutras of Canada had the fight even, at 124-124, while judge Yasaku Yoshida of Japan, whose indecision had been such that he'd called six rounds even, actually had Duran ahead 127-126, as did Ove Ovesen of Denmark, 125-124. 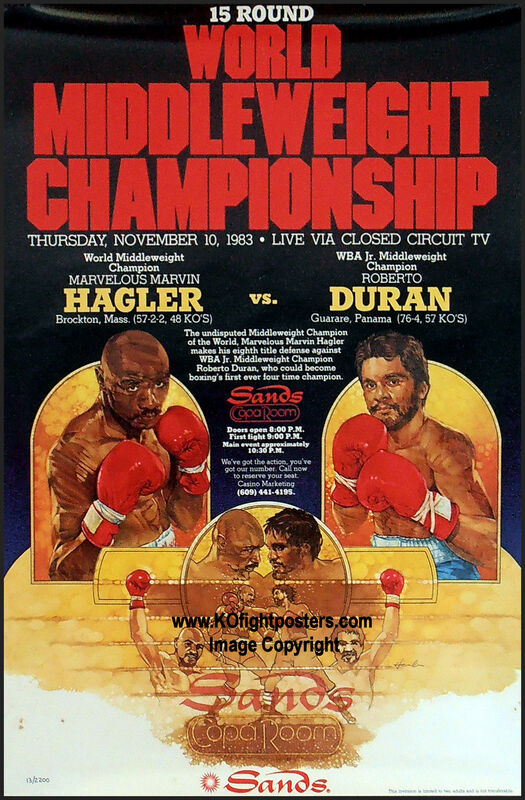 It was unmistakable that Duran had craftily fought within reach of victory in the 12th and 13th rounds. But this was to be the tipping point as Duran tired badly in the 14th & 15th letting Hagler outwork him thus retaining his title. 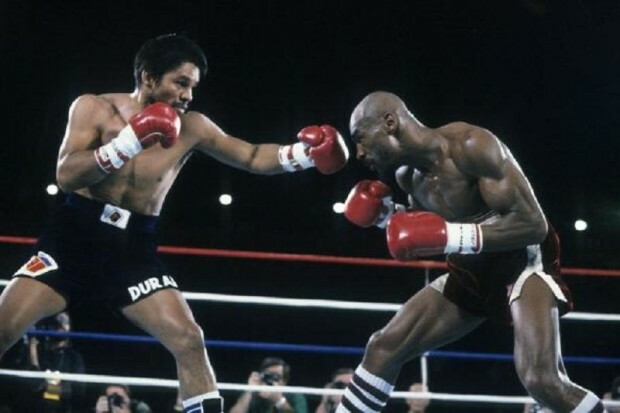 If it had been over the modern 12 round distance then Roberto Duran would have won the fight & made history by becoming the 1st ever 4 division champion. Condition : Good*minor handling*surface*edgewear*minor foxing to lower left hand side.